Mount Wutai is a sacred Buddhist site at the headwaters of the Qingshui in Shanxi Province, China. Its central area is surrounded by a cluster of flat-topped peaks roughly corresponding to the cardinal directions. The north peak (Beitai Ding or Yedou Feng) is the highest (3,061 m or 10,043 ft) and is also the highest point in northern China. Wutai was the first of the mountains to be identified and is often referred to as "first among the four great mountains". It was identified on the basis of a passage in the Avataṃsaka Sūtra, which describes the abodes of many bodhisattvas (enlightened beings). The bodhisattva is believed to frequently appear on the mountain, taking the form of ordinary pilgrims, monks or other figures most often depicted in unusual five-colored clouds. 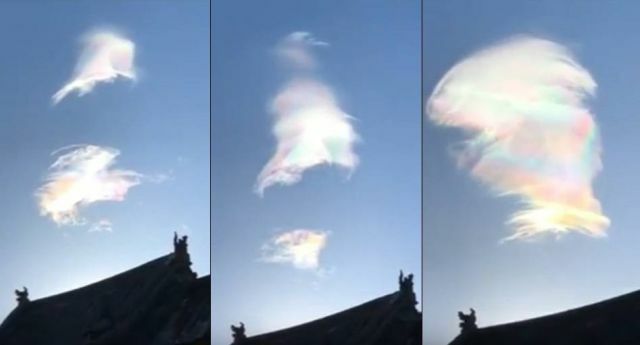 Now, this happened on December 19, 2017 when very strange iridescent five-colored clouds appeared in the sky over the sacred Buddhist site. Then the clouds start to float, change shape, until they take the form of what looks like a bodhisattva. Some skeptics claim that the story about the bodhisattva is a myth, but after seeing the next video, maybe they will change their minds.